Michael: Hi, welcome back to the show. I'm here with Steven Hauer from cf.Objective(). 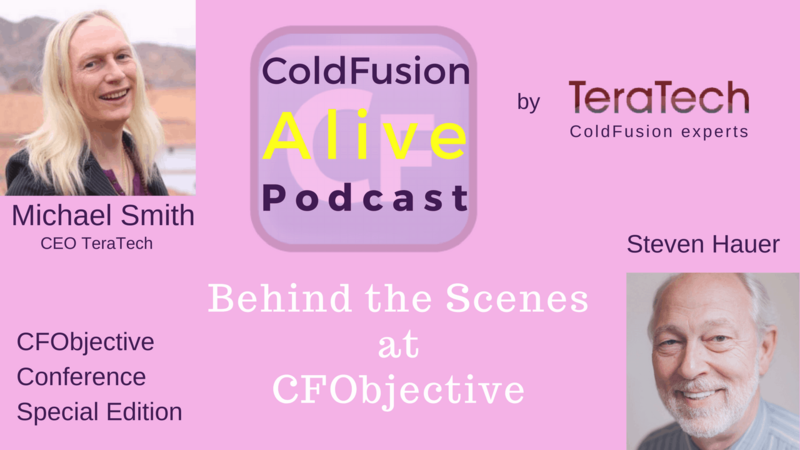 We're going to be talking about everything cf.Objective(). Welcome, Steven. Steven Hauer: Well thank you, Michael. It's good to be able to talk to you today. Michael: What exactly is cf.Objective() for anyone who hasn't heard of it? I know it's been around for 11 years, but maybe someone out there hasn't heard of it. It's a ColdFusion conference, right? Steven Hauer: It is a ColdFusion conference. It initially started in 2006 in Minneapolis and a simple one line description of the conference [inaudible 00:00:41] CFML and web centric conference. It covers a wide variety of topics relating to software development. Michael: Why the objective in the name? Steven Hauer: That was sort of a play on a CMFL tag at one point when we originally started the conference. It was, I guess we were making it our objective to put on a conference that was meeting the needs of the community that were in an area that weren't particularly being addressed by what was available at the time. The conference has always had a focus on the strong intermediates to high level user rather than the beginning user of CFML. That was … most conferences come off as either to the general population within a community or a product specific conference where somebody has whatever it is that they're developing, they want to [inaudible 00:01:47] support for that. With cf.Objective() we were targeting the best of the best, the programmers that either were already or wanted to go beyond what the everyday average developer's going to do. Michael: Fabulous. This year you've moved to a new location over here. Where is it going to be this year? Steven Hauer: Yes we have. We've been … after our first 11 years in Minneapolis, Minnesota. We have packed up and moved to Washington D.C. and in July, the third week of July, the 20th and 21st we will be at the National Press Club in Washington D.C.
Michael: Is that easy to get to for people who don't live in the D.C. area? Steven Hauer: Yes. Well you know, Washington D.C. is serviced by three different airports and it's just a short shuttle ride or taxi ride from any of those airports to the downtown D.C. area where the Press Club is. We have a number of hotels. This is all information that can be reached on our website, it's cfobjective.com. A number of hotels that are in within walking distance, and walking distance is five or ten minutes from the site of the conference. All that information is available on our website so people can get to the area and have a place to stay and attend the conference easily. Michael: And it's near a metro station for people coming … staying elsewhere in the area or …? Steven Hauer: There are a number of metro stations surrounding the entire area, so yes. Michael: Perfect. Very easy. Are you thinking more people in, who do ColdFusion engulfment might be coming this year or … ? Steven Hauer: Well, that is one of the reason that we chose D.C. ultimately for our conference this year. We've been located in the Midwest for the last 11 years and it's always been … well there haven't been many complaints about our conference, there have been a few and one is that Minneapolis is not easy to get to. You can't fly into it and for those that have tight budgets, stricter budgets as far as travel and or training, it's a little costly to travel there and have to stay there. In the D.C. area we can … we're in the center of things where people will be able to get there and not have to travel as far. Certainly it's not [inaudible 00:04:23] flying across the country and it is a hub of activity, transportation, and excitement. So I think the D.C. area is a good place for us. Michael: You mean it is even more excitement than learning advanced ColdFusion stuff available? Steven Hauer: I think probably yes. Michael: Who are some of the speakers who are going to be at cf.Objective() this year? Steven Hauer: Oh, some of our speakers would be … and again, we have a complete list of our speakers and their topics and our schedule is available on our website. One popular name that always comes up would be Charlie Arehart who will be one of our speakers. Gert Franz from the Lucee Association is one of our speakers. Ray Camden is going to be making a presentation as well and Gavin Pickin is CFML community [inaudible 00:05:28] and recognized. Brad Wood will be another one of the speakers. Dave Ferguson. I could go on for a little bit longer, but I guess I will direct people to the website and say, go and look at them all. All their information is there, their topics, when they'll be presenting, what they're presenting on, and you get to see a picture of their smiling face in full color as well and that's always nice. Michael: Fabulous. Well sounds like an exciting line-up. I certainly know a lot of the names there and I've seen them speak and they're really good. Sounds like you've got a great line-up there. Steven Hauer: We're excited to have these people here. We really are. Michael: Is it single track, or multiple track? How does this conference work? Steven Hauer: Actually, we've trimmed down from what we've done in the past a bit. It used to be three days. We would have an opening ceremony the night before before the conference and then run Wednesday, Thursday, Friday and run five tracks and this conference is trimmed down. We're going to run Thursday and Friday we'll have some opening event on Wednesday night, some gathering that will be announced at a future date, but then we'll run Thursday and Friday and we'll be running four tracks this time. Michael: Wow. That sounds like people will be spoiled for choices to what they can learn. Steven Hauer: Yeah, they'll have to … the schedule, like I said the schedule is up and you can get to that, again by going toward our website cfobjective.com and everything is listed there. One thing that I guess … I would mention the fact that we have a lot of speakers and we like to keep our speaker to attendee ratio really low so that you actually get to interact with the people that you're there to hear, the people that you're going to be learning from. It is like one person talking to 200 people in a room. It really will keep it much more intimate than that. And that's always been one of the most exciting things about cf.Objective() is the fact that you actually get to sit down and have that kind of face-time with the presenters, as well as just seeing them make their presentation. Michael: That sounds great. So it sounds like … what are the four tracks you have this year? Steven Hauer: I'm gonna have to look and see because we've had some debate and now that I say tracks I may have to say, we're not actually naming the tracks because we're tagging the sessions instead. Steven Hauer: So that you can go through and look at the items on the schedule and pick the tags that you want rather than lock yourself down to a specific track. Steven Hauer: Absolutely. Well, in the open common area where the sponsors are and so on there'll be room for people sit and talk about things and again, interact with presenters between sessions and … the problem is when a presenter is there instead of having them available when they're not presenting, they're usually in another session because they want to take advantage of all of the really good material [inaudible 00:09:15] the content is really, really the big thing. Michael: Well I'm sure there will be an after hours bar or some other thing where people can get together and talk over programming and other topics. Steven Hauer: Yes and we'll be … actually all of the speakers will be staying at the J.W. Marriott and we'll be able to connect with them there after hours. Everybody will be there. Except the ones that are out site seeing around on the Capital Mall and so on. Michael: Yeah, there's a lot of sites to see in the D.C. area so you can always come and and make a weekend a bit and stay through the weekend and see a bunch of sites with your family if that's what you wanted to do. Let's just … sounds like a great conference, Steven. Let's just change topics. So you've been doing this for 11 years. Why are you proud to be involved with ColdFusion for so long? Steven Hauer: Well I got started actually … again, we found that there was a gap in what was being made available in the ColdFusion community. There wasn't anybody addressing that echelon of developer that had already or was aspiring to go beyond the average. They really want to excel in what they're doing and that's what got us started. What we found that the ColdFusion community as a community is exciting. The people are interesting, the people are fascinating, the people are passionate about what they're doing. People that are involved with ColdFusion and CFML are excited about the fact that they have this tool, this platform to work on. They really are. It's just great to get those people together in a room and spend time with them. Steven Hauer: They're fantastic people. Michael: They are. This [inaudible 00:11:39]. I've noticed this year that the passion and enthusiasm has picked up. I might say that's because we launched the CF Alive podcast, but I think there are other things going on as well. There's just a lot of new ideas in technology. Steven Hauer: Well, you might have something to do with it. Michael: Yes. Well and then so do you now as you are involved in this conference for so long and making changes in it to make it more exciting. 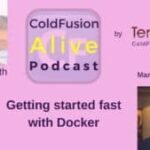 What would it take to make ColdFusion more alive this year? Steven Hauer: I think to have hundreds of people come in to cf.Objective(). Steven Hauer: No. Go ahead, go ahead. Michael: Tell us more about what would make ColdFusion more alive for you as well as having hundreds of people at cf.Objective(). Steven Hauer: I think I would like to see something more from the CFML community as far as the providers, the software providers. 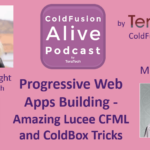 Of course we have a [inaudible 00:12:55] with ColdFusion, with the Lucee Association, with their CFML engine. We have other providers and I would like to see them be more prominent in what's going on. Ortus Solutions has been doing their end of the box. I would like to see other software developers take that sort of evangelistic approach to what they're doing as well, so that they're out there in front of people constantly. I think that's important to keep the community alive. Not just advertising, not just showing up at a conference with a booth to say this is my product, but take your product out and do a roadshow with it. I think that would make a big difference to people. Michael: That is a great suggestion. I will be talking with some of those folks. 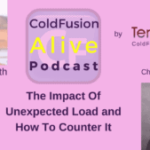 In fact, I'm happy to interview anyone to do with ColdFusion on the show so if anyone listening, even if you want to be on the show or if you know someone you'd like to nominate to be on the show. Please let me know. Anything special you're looking forward to this year at cf.Objective()? Steven Hauer: … people face-to-face most of the time so this is a good time. Michael: Excellent. Well I really appreciate you being on the show, Steven. I know you're calling from a long way away so I appreciate you making the call and I'm looking forward to cf.Objectives() this year. Steven Hauer: Wonderful. We hope to see you there too, Michael.